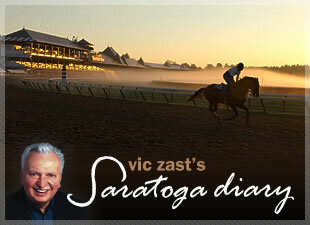 Wednesday in Saratoga offered up a mixed plate of emotions. It was the first Foxwoods Mardi Gras Day, a promotion that was pitched as an afternoon on which the racecourse would be turned into New Orleans. Alas, it seemed like a drummed-up excuse to promote something so that one day didn’t pass without anything. 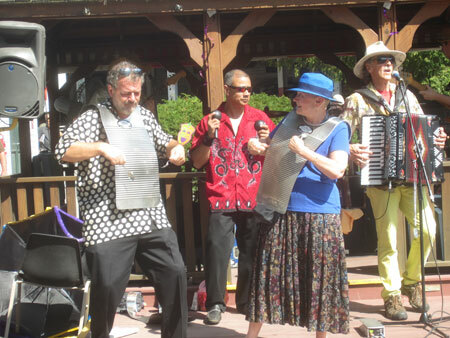 Caption: Renee Spilman of New York City, wearing blue, steps into to play the spoons with a Zydeco band. Ten thousand strands of beads were supposed to be distributed. Louisiana food was to be served. Captain Squeeze and the Zydeco Moshers entertained a handful of people from the backyard bandstand. There were green, purple and gold banners hung here and there. Yet, you felt less who dat on Mardi Gras Day than Irish on Mid-Summer St. Patrick’s Day or youthful on College Day. Foxwoods, by the way, will be title sponsor of the upcoming gr. 1 King’s Bishop Stakes on Travers Day. The King’s Bishop is the seven-furlong sprint in which the reigning juvenile champ is expected to make his return to the races. Uncle Mo reportedly is well underway to completing his fitness training. He shot a speedy 1:00.22 for five furlongs Tuesday morning on the deep Oklahoma track under leading rider John Velasquez. “He felt great” was J.R.’s understatement. Meanwhile, there was not much to the action on the main track. Only four horses ran in the sixth race. The fifth race gave fans a preview of the kind of long distance running to expect from the tenth race this upcoming Saturday. It was a 1-1/2 mile grass race called the Signature Stallion Waya Stakes on the turf around three turns, which is what the gr. 1 $500,000 Sword Dancer Invitational will be. VERSUS , a participant in the NBC Sports Group, has invited Rosie Napravnik to be a guest analyst on the Sword Dancer’s nationwide telecast. Trainer John Kimmel saddled second-time starter Vexor to win the fourth race. Most bettors figured that either Raconteur, a heralded A.P. Indy colt trained by Todd Pletcher for Dogwood, or Seeker, by Hard Spun, trained by Steve Asmussen, was the class, but neither was as fast. Irad Ortiz Jr. guided Rizzi’s Comet through on the rail in the stretch to win the third race, something he couldn’t successfully manage the last time the horse ran. Visitors from New York City who drove were delayed an hour on the Thruway when the road between Exit 23 and 24 was closed because a construction worker caused a gas pipe to explode. Belmont Park’s hopes for hosting the Breeders’ Cup officially also exploded. A terse expression of resignation from Charlie Hayward was issued. Pity the Exacta Taco stand, also. The second floor concession is hurting, too.